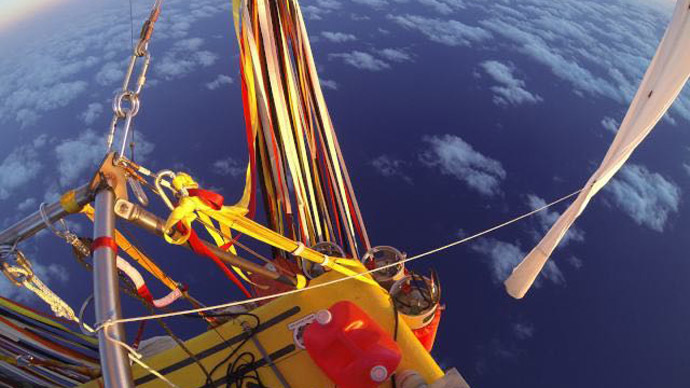 American Troy Bradley and Russian Leonid Tyukhtyaev have surpassed a 5,200-mile (8,800-km) distance record with their gas balloon flight across the Pacific. The “Two Eagles,” as they are dubbed, are set to land in Baja California, Mexico, on Saturday. As the record was beaten Thursday morning, flight officials applauded at the Anderson-Abruzzo Albuquerque International Balloon Museum in New Mexico, and people who were there posed with pictures counting the distance flown, Reuters reported, citing Art Lloyd Jr., a mission support control worker at the site. "We're really excited and just now concentrating on getting them to a nice safe landing," Lloyd said. They are also on course to beat a 1978 flight duration record of 137 hours, 5 minutes and 50 seconds on Friday morning. Bradley and Tyukhtyaev have been on a diet of fresh fruit, freeze-dried hikers' meals, beef jerky and sometimes a hot meal from a small stove, according to Lloyd. Their equipment includes, among others, cold weather gear such as sleeping bags and a heater. The pair started their journey early Sunday from Japan, local time. Earlier, they were on track to land in southwest Canada, but weather changed their plans, so they decided to land in Mexico. The Two Eagles’ progress can be tracked in real time on the flight’s website.